We're underway and the All Blacks have spilled the kick off. Aussie are on the front foot early and set themselves up in a good attacking position 40m out. But the ball is lost forward. All Blacks will have a chance to settle things down with a scrum 40m out from their line. Huge scrum from the Wallabies and they very nearly pinched it. But Aaron Smith was able to clear. And quickly they win the ball back. Quick hands in midfield sees McCaw nearly find a gap. Australia very nearly break free with an intercept, but are then penalised. It's very scrappy early doors. Carter kicks for touch and the All Blacks will throw in from just inside the Wallabies half. Already a few mistakes from both sides. Both tell me it's going to match last year's dour 12-12 test. All Blacks win the lineout and quicly fire the ball toward the left wing. But the Wallabies turn the ball over through Pocock. And just as quickly they knock the ball forward. Aussie have looked good at the breakdown early on but have struggled with a few dodgy passes. SBW is well taken in a midfield tackle. But Pocock has pinched one again. There's a pattern emerging here. ABs run the ball, get tackled, Pocock pinches it, Aussie lose it forward. For the third time in the first 5 minutes, we watch Aaron Smith pack down a scrum. This time the All Blacks break wide right through Milner-Skudder. All Blacks are awarded another penalty and Aaron Smith takes it quickly. He doesn't get to the line but he has earned NZ another penalty, and has forced an Australian yellow card. Have always rated Wayne Barnes. Sekop Kepu made a professional foul to stop the try and it sent to the bin. Carter will kick for goal from right in front. Carter slots the kick and the All Blacks have an early lead. Folau has a chance to run at the ABs now and is taken down on halfway. Matt Giteau releases a decent kick from the next phase and Ben Smith can only watch it run out of play in the corner. Aaron Smith clears and the ball was partially charged, meaning it's an ABs lineout. MIlner Skudder lights up the Aussie right wing, breaking a tackle and releasing McCaw who fumbles the ball. But the All Blacks still have it on halfway. Great linkup play from the ABs in midfield creates a gap but the final pass was astray and the ball went down again. It's being played at a hectic pace. A kicking battle breaks out between Ben Smith and Folau. 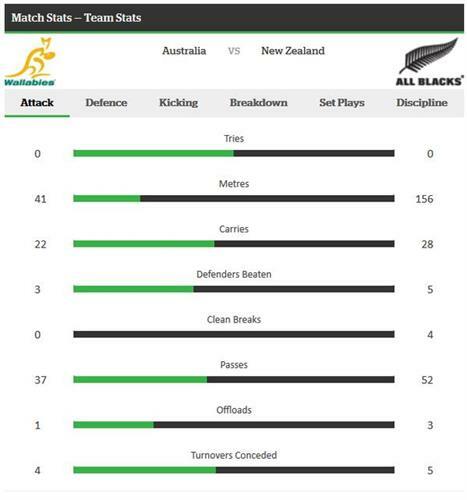 It ends with the ABs stabilising possession on halfway. It's a real midfield arm-wrestle here. Long sequence of play with plenty of turnover without any side really looking dangerous. Horwill penalised for being offside at the ruck. Oh dear. That was a shocking kick from Dan Carter. He failed to find touch and the ball ended up dribbling out over the dead ball line. Wallabies will now re-start with a scrum on halfway. abs are playing with huge intensity. Beaver would have found touch. All Blacks charge down the attempted Wallabies clearance and there is a mad scramble for the loose ball. It looks like the Wallabies won the race but we are checking upstairs. Aussie restart with a 22 drop out. Carter responds with a huge midfield bomb and it's taken expertly by Folau. Woodcock drops a pass now in the middle of the park and Aussie pounce on it. Barnes pulls play back for the scrum as Aussie has no advantage. Match stats so far. All Blacks lead 3-0. 19 mins. Aussie have hardly spent anytime inside New Zealand's half and once again are struggling to achieve quality possession. The phase ends with Folau booting the ball into touch 30m out from the NZ line.